Mortgage rates are low, down payments are low, and the demand for more housing is high, boosting builder confidence. According to the a survey from National Association of Home Builders (NAHB), the demand for housing is on the rise nationwide. As of November, builder confidence rises four points and Single-Family constructions were up 4.2% topping off at 696,000 on an annual basis, which is the second highest since 2008. The seasonally adjusted applications to purchase homes increased by 11.7% the week of November 14th. As for mortgage purchase activity, the share of FHA and VA purchase loans also increased in the week’s survey according to National Association of Realtors’ Economists’ Outlook research. Home builders and home buyers are confident today than ever, thanks to low trending rates. See if you are eligible for today’s low rates, by simply clicking here. The continued upward trend in home selling brings optimism to builders, boosting the confidence of a healthier economy in the upcoming year. The unemployment rate has edged down to 5.8%, fuel prices are lower by 1.3%, along with other price for goods. Pending housing in demand are predicted to hike up single-family production of more than 800,000 in 2015. Despite the anticipation of rising interest rates in 2015, the rising trend in employment rate and lower prices on goods and services. And because of this, home builders remain optimistic, as it should help offset the higher home prices since potential buyers’ income should increase as well. With the housing market picking up and steady improvements in all economic aspects, builders believe that the U.S. economy may see full recovery in 2015. 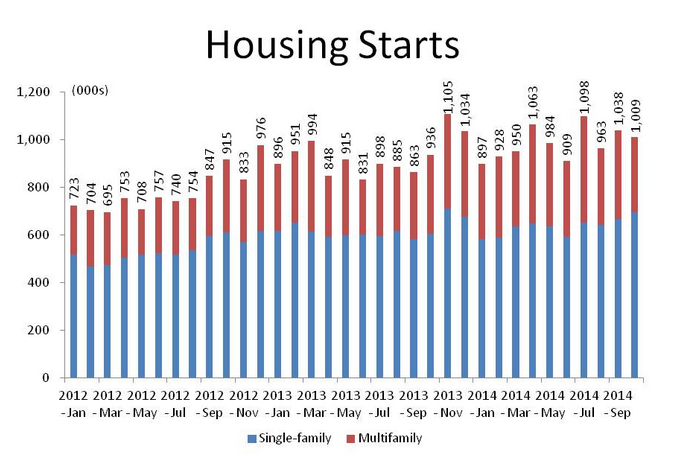 Single-family housing recovery started out rather slow in 2014. However, single-family starts averaged 925,000 in the first quarter on an annual basis and a significant improvement in the third with an average of 1,024,000. After seeing improved numbers in single-family housing, the fourth quarter is expected to be even higher. 2014 is coming to a close soon and mortgage rates are expected to trend higher in 2015. Speak with a mortgage lending professional for a free rate quote to see what rates you can take advantage of.